I love Matisse. He used a lot of positive and negative space in his cut-out work which makes learning about him a great way to teach children the difference between these two terms. 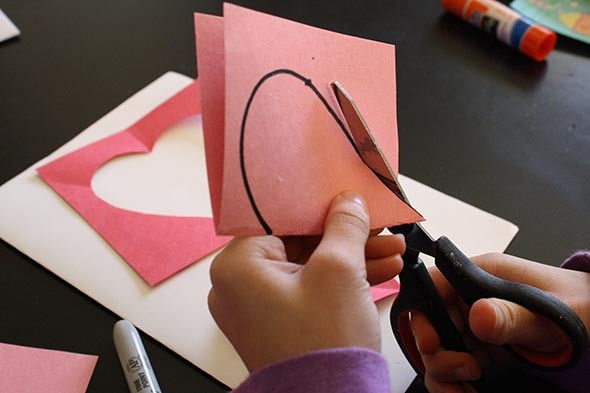 If you want to make Valentine-making a bit more educational, use Matisse as your point of interest and combine learning about a great artist with learning about positive and negative space, all while making a special someone a Matisse Valentine card. This is a great lesson even for preschoolers. Matisse was the first artist I introduced to Bear at the age of 2. Start the lesson by reading a picture book about Matisse. My two favorite (Henri Matisse: Drawing with Scissors and Matisse the King of Color ) are probably too long for the average 2 year old, but are great for the 4 and up crowd. A two year old would enjoy the pictures and you can just retell the information in amounts your child can handle. You are the best judge. Matisse was ill later in life and could no longer paint. He started cutting shapes out of paper and he had assistants arrange these shapes on canvases as Matisse dictated where to put the pieces. 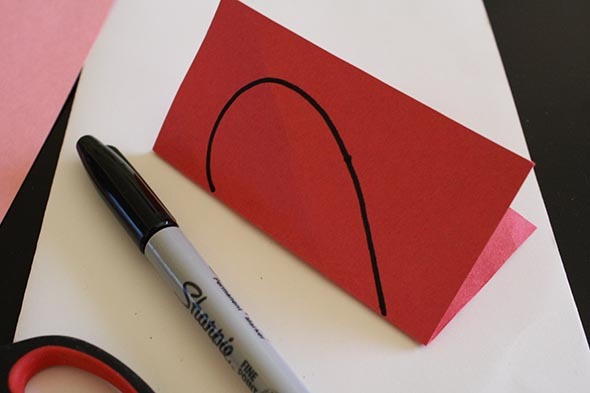 When he cut out a shape, a shape would be left behind in the paper. The shape he cut out is called positive space, and the shape left behind is called negative space. If you look at The Clown for example, you can see how he used both the positive and negative space in this composition. 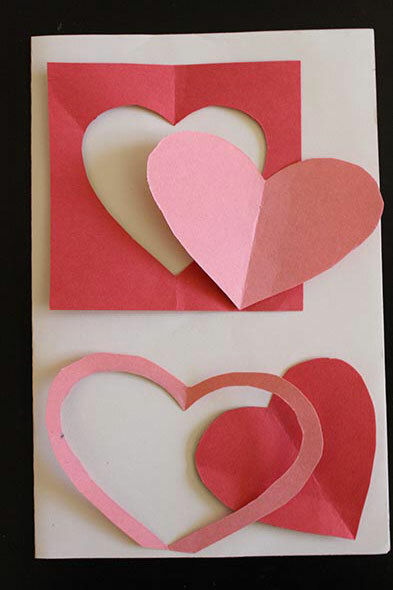 You can make your very own Matisse-inspired Valentine card. 1. 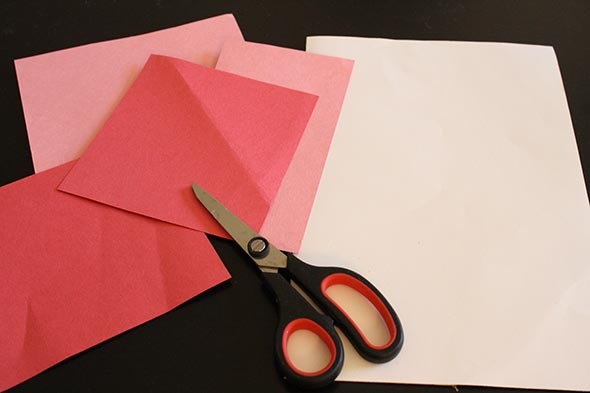 Fold the white piece in half to make the card. 2. Cut a square of red and fold this square in half. 3. Draw half a heart on the folded square and cut it out. 4. Cut out the heart. You are left with the negative shape. 5. Cut out several more hearts of pink and red. Cut other organic shapes, too, if you like. Matisse used mostly all organic shapes in his art. 6. Lay out your hears on your white card, using both the positive and negative shapes. 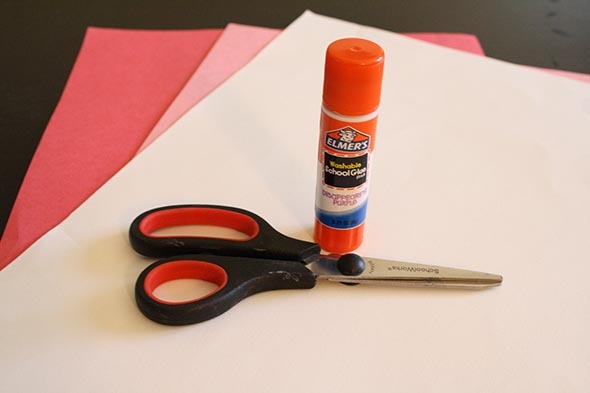 Glue them down and then your Valentine card is done! If you’d like more Valentine Day card ideas, check out Candace’s clever use of Project Life cards to make Valentine cards. And I love Michele’s reminder that romance isn’t just for Valentine’s Day. One of my big “Mommy fails” is that I seem to forget to do all the fun holiday stuff with my kids. You know, the stuff they all do in public and private school. 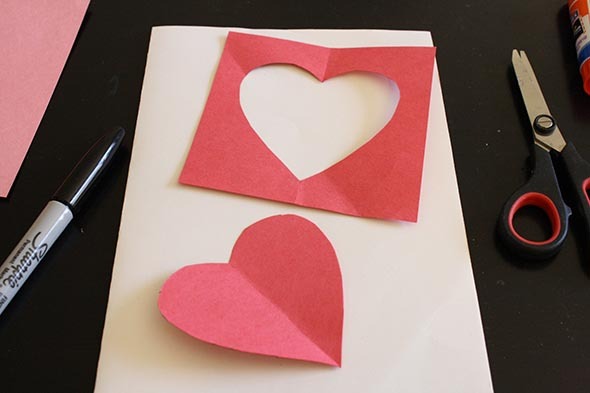 I think Pam’s 14 Not-Just-For-Preschool Valentine’s Activities would work well for us as they are Valentine’s activities across the curriculum. I also printed out her 14 Ways to Tell Your Kids “I Love You” with the Gift of Time. I know my children will enjoy being the recipients of undivided Mommy time. This post is part of a TOS Crew Round-up. Get lots of Valentine inspiration by visiting this great round up of Valentine’s Day Resources.